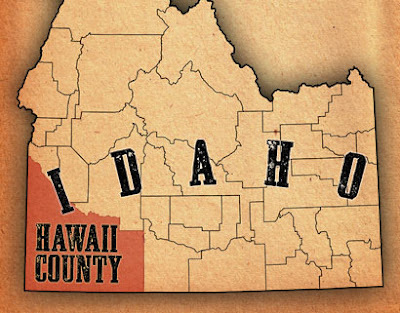 Why in the world would there be a county in Idaho named in honor of three lost Hawaiians? It's true. And the story is rather unexpected. Once Captain Cook set foot on Hawaii, it became clear to Europeans that the people of Hawaii were excellent mariners and hard workers. So Cook and others hired Hawaiians to work on board ships of the era. In the early 1800s, many of these vessels visited the coast of what is now Oregon and Washington. Many Hawaiians went ashore and got hired as trappers... since there was good money to be made in beaver pelts. In 1819, three of these Hawaiians were sent into an uncharted region in what is now southwest Idaho. They were never seen again. Over time, the region was named for these lost trappers. Wait a minute, you're thinking.... there is no Hawaii county on the Idaho map! That's because spelling wasn't standardized back then. They just spelled names the way they sounded... and so it came out "Owyhee." Say "Hawaii" out loud. Then say "Owyhee" out loud. Ah, get it now?! So my map above uses the modern spelling, but make no mistake, the county in Idaho is named for a Hawaiian mystery. California to split in 2? Beautifully illustrated, this fascinating new book looks at the states that never made it. 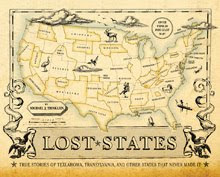 Packed with dozens of full-color maps, Lost States is a fun way to learn a thing or two about American history. Beautifully designed... fires the imagination in wonderful ways. Amazon - order the book! Sample page from "Lost States"